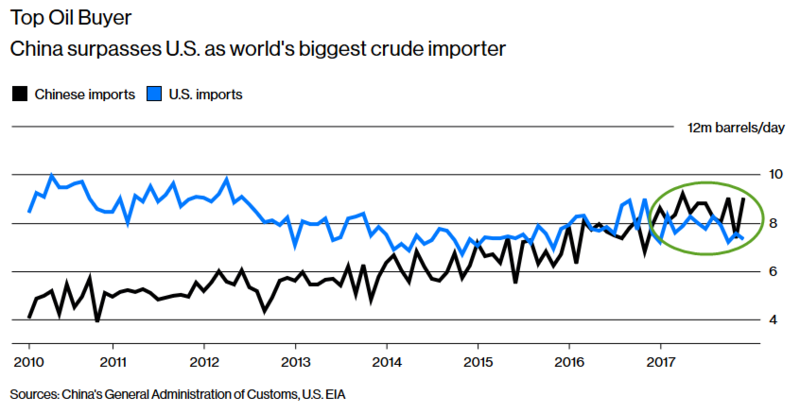 The "huge story",as Graticule's Adam Levinson called it, will, it appears, be a "wake up call" for the West that seems to happily be ignoring this potential bombshell that is China's looming launch of domestic oil futures trading. Not any time soon, since paying for oil in dollars is an entrenched practice, according to some analysts. Shady Shaher, head of macro strategy at Dubai-based lender Emirates NBD PJSC, says it makes sense in the long run to look at transactions in yuan because China is a key market, but it will take years. Bloomberg Gadfly columnist David Fickling argues that China doesn’t have “nearly the influence in the oil market needed to carry out such a coup.” On the other hand, paying in yuan for oil could become part of President Xi Jinping’s "One Belt, One Road" initiative to develop ties across Eurasia, including the Middle East. Chinese participation in Saudi Aramco’s planned initial public offering could help sway Saudi opinion toward accepting yuan, which is used in only about 2 percent of global payments.